I made two attempts at candied fruit and, truthfully speaking, neither one was what you would call a complete success. Consequently, I will not be posting a recipe this time, the fruits were edible, but not as candied as they should have been. I will try to revisit this in the future using different recipes and/or fruit. I think the problem is that the final stage in most candying recipes involves drying the fruit for a long time – sometimes days – in a warm, dry, “blood-warm” (lovely phrase!) oven. I tried leaving my oven on a low heat for as long as possible, but I wasn’t about to leave it on overnight. An Aga would probably do the job perfectly, but I don’t have one of those. There are other methods to try that involve long soaking in syrups, I’ll probably try that in the future. There are some other things I want to try first though. 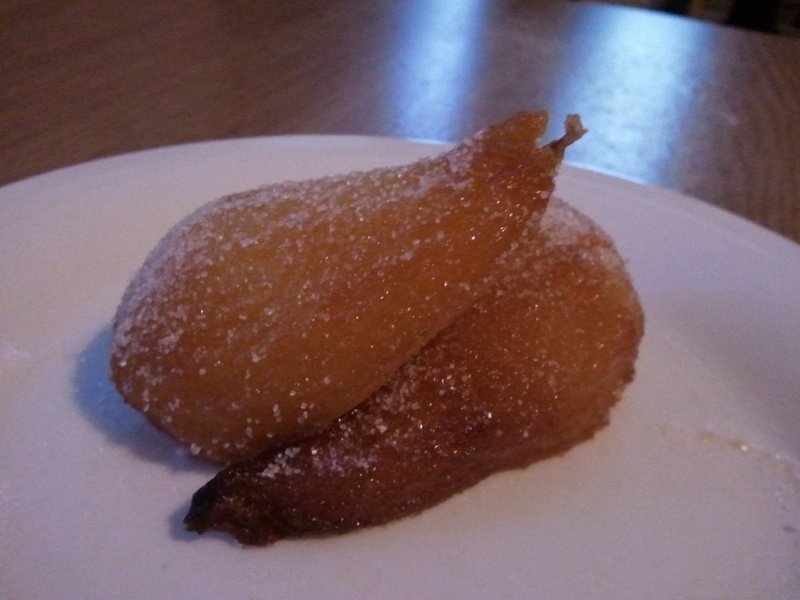 Anyway, here’s what happened when I tried to make candied pears and plums…. Take your Apricocks the fairest and scald them, and pill them, between two clothes crush the water softly out of them as dry as you can without too much flatting them then take of searced sugar almost as much as they weigh, and boil it altogether to a Candie height, then take it off the fire, and lay the Apricocks in it one by one, with a feather annoint them over, then set them on a chafing-dish of coales, and let them be through cooked but not boil, then take them off the fire, and set it in a stone or bloud-warm oven, and twice a day set them on a fire, and turn them once at every heating, annointing them with a feather, and the same syrup every time you take them off the fire, this doe untill you see the syrrup begin to sparkle, and full of eyes, then take them out of the syrup, and lay them on glasse plates, and dry them in a stove or oven· turning them a day or two till they be dry, white Pear plums may be done thus. To candie Peares, Plums, or Apricocks, that shall look as clear as Amber. Take your Apricocks and Plums, and give every one a cut to the stone in the notch, and then cast Sugar on them, and bake them in an Oven as hot as for Manchet close stopped, bake them in an earthen psatter, let them stand half an hour· then take them out of the dish, and lay them one by one upon glasse plates, and so dry them, if you can get glasses made like Marmalet boxes to layover them they will be sooner candied, this is the manner to candie any such fruit. 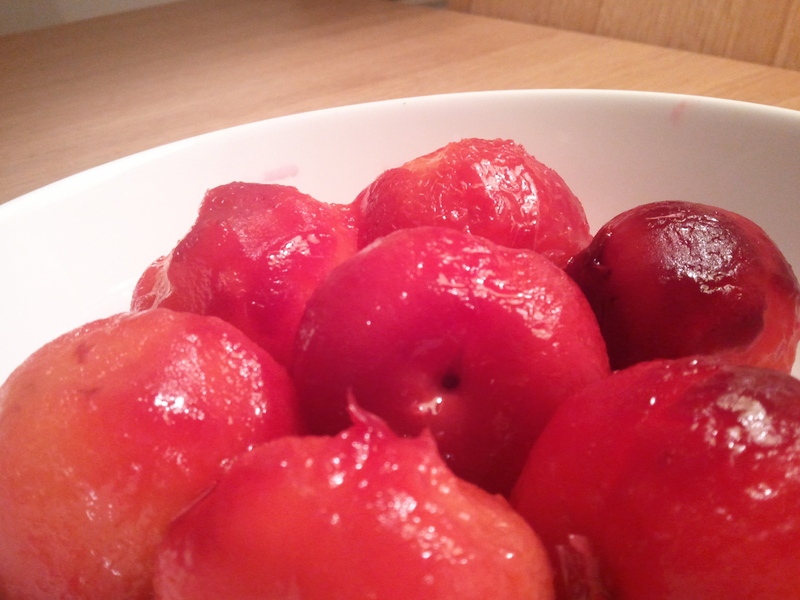 Given the seasonal lack of apricots, I attempted the first recipe using plums. Things went fairly well at first. 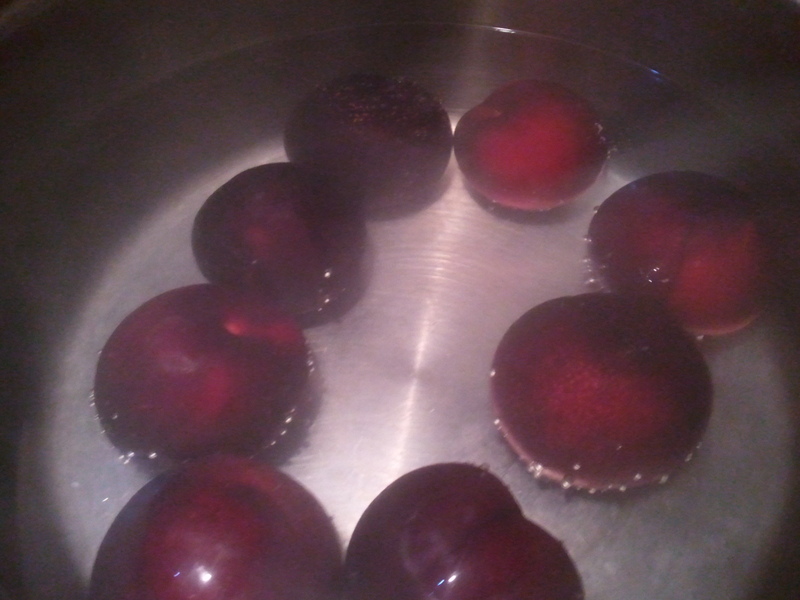 I blanched the plums, pealed off their skins and put them in a colander to drain some of their liquid away. I tried lightly crushing them but they were quite soft and I didn’t want them to turn to mush. 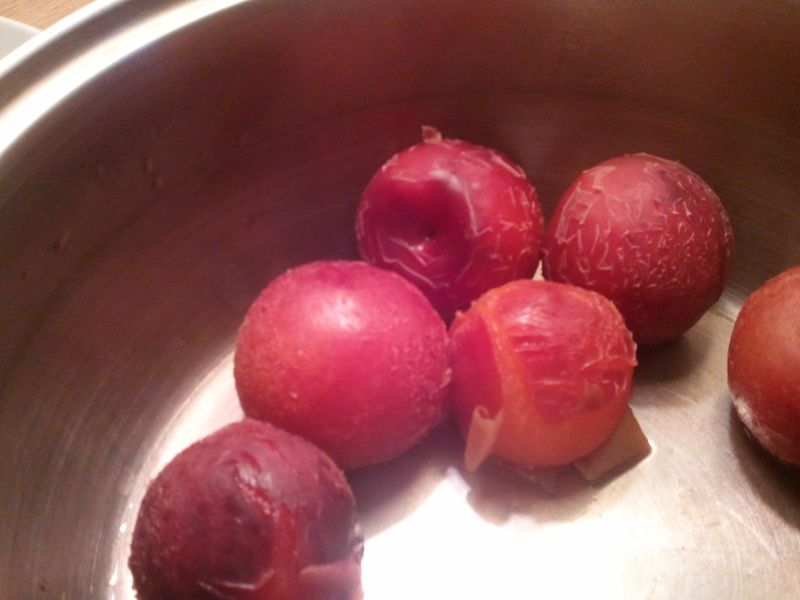 I weighed the plums and then measured out the same weight of sugar and added a little of the cooking liquid to it. I boiled it and used a sugar thermometer to heat it to a caramel (aka the hard crack stage). I poured this caramel over the plums and warmed them through in a saucepan. Then I heated them through in a low oven for a few hours, before heating them through on the stove again. This was about as far as I got however, after a day of cooking in this way they didn’t look very “full of eyes” or sparkly. 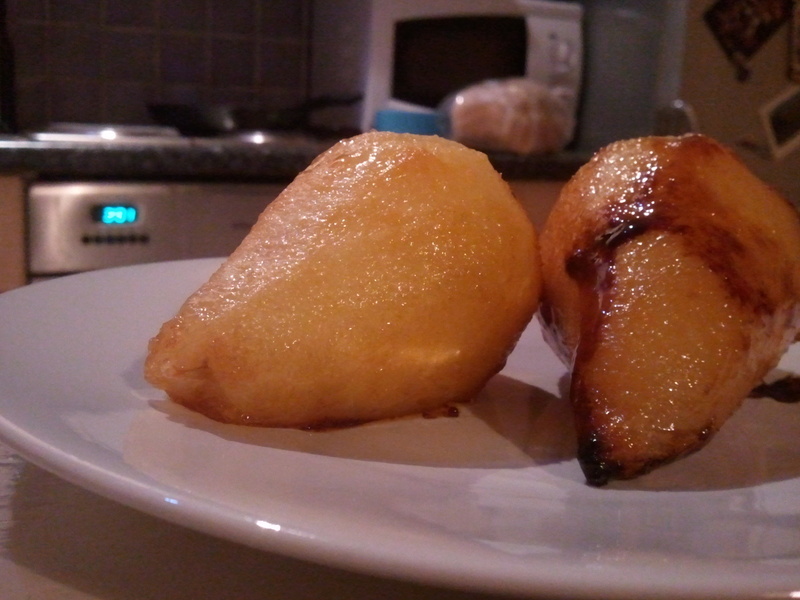 They tasted quite nice, and would probably do as a pudding, but I couldn’t say they were near to being candied. Not having anywhere warm to keep them overnight, I decided to abandoned them and move onto the next experiment. 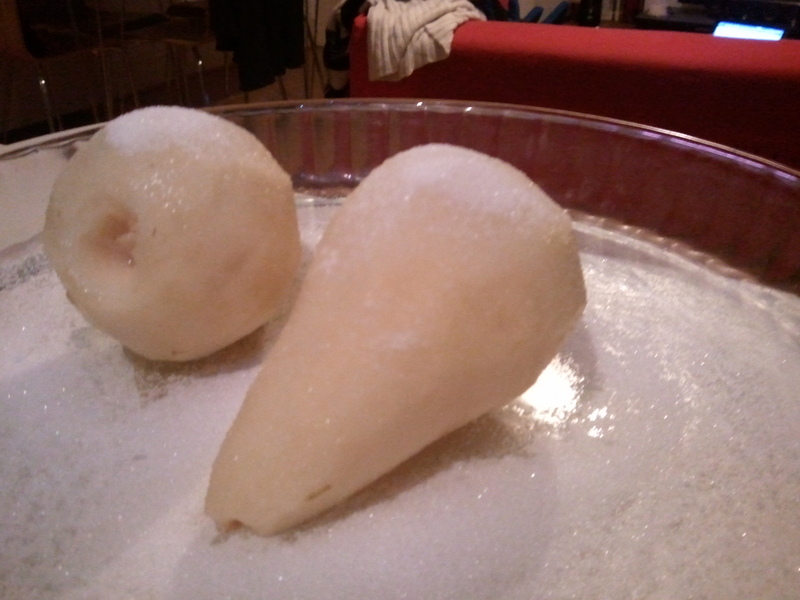 The pear candying was a little more successful, but still not spot on. I pealed them and covered them with sugar, and then baked them for an hour in a medium-hot oven, about 200 c.
Again, I tried to dry them in a very low oven for a few hours. 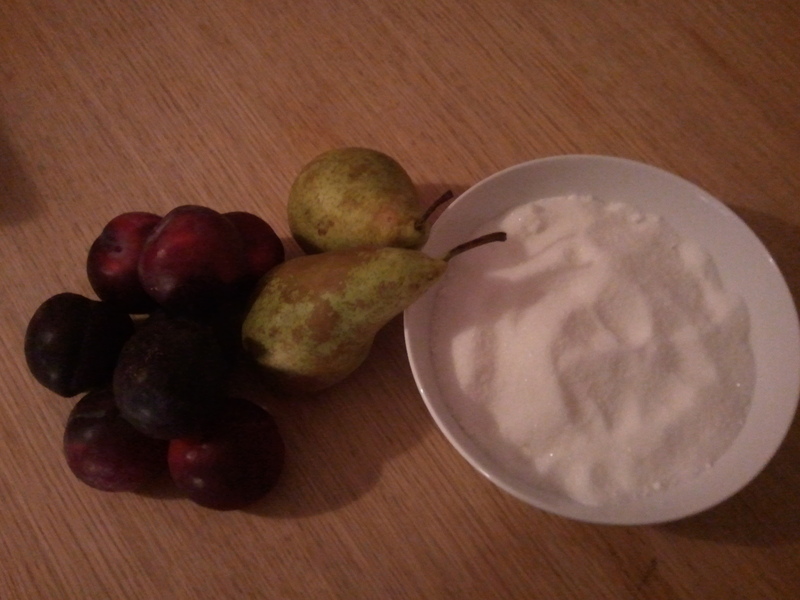 The pears reduced in size and gave up a lot of liquid, I then rolled them in some granulated sugar. They were not quite as “candied” as they should be, they were still a little juicy and not really dry enough. So, a not entirely successful adventure in candying, but I will not give up! I will return to candied fruits, but next time I’ll be doing something special for Valentine’s Day.